There is no end to the variety of crostini one could conjure up. One could get quite fancy but should never forget the humble origins of this elemental food. I’ve read that this was a quintessential Tuscan peasant food. Peasants knew what it meant not to have food but one thing they did have was flour so they made a very simple bread of flour and water. The other thing they had was very heavy, unfiltered olive oil. In the beginning they would simply brush bread with olive oil and salt and toast it (fettunta). 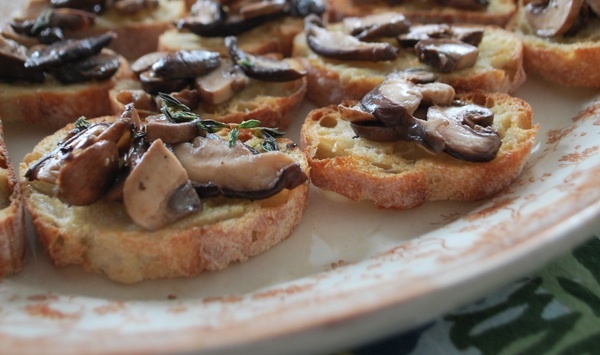 Then the peasants started to add garlic and, once in awhile, some tomatoes (bruschetta), or mushrooms (crostini) and the experimentation went on from there. Place sliced baguette on a cookie sheet and toast in the oven until brown and crisp. Meanwhile, heat olive oil in a heavy saucepan. When hot, add sliced mushrooms and cook until they begin to sweat. Add white wine and sprigs of thyme and cook until wine is reduced to a thick syrup. Add sea salt and pepper to taste. Set aside. When baguette is toasted, rub each slice back and forth a few times with a garlic clove to coat in garlic (one clove will do for about 5 – 6 slices). Once each slice has been adequately “garlic-ed” top with mushroom mixture, sprinkle with a dash more sea salt, and serve immediately.